After his 2018 season was limited to 18 games, he hits .364 in spring training before being sent to minor-league camp. TAMPA, Fla. — The Yankees’ top prospect going into this season is 21-year-old outfielder Estevan Florial. 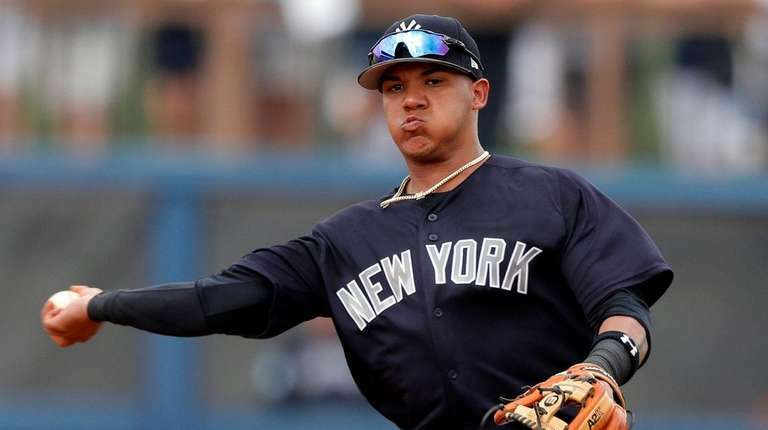 But the exciting centerfielder’s 2019 debut will be delayed after he suffered a non-displaced fracture of his right wrist when he crashed into the centerfield wall at Steinbrenner Field on March 16. The Yankees have other prospects who have caught manager Aaron Boone’s eye. One is infielder Thairo Estrada, whose 2018 season was limited to 18 games after he was shot in the right thigh in January at a restaurant in Bejuma, Venezuela. For medical reasons, the bullet was not removed until July. Estrada, a 23-year-old middle infielder, was a star in 2017, hitting .301 with six homers and 48 RBIs in 122 games at Double-A Trenton. He hit just .192 at two levels in 2018 but impressed Boone this spring training by hitting .364 (8-for-22) before being sent to minor-league camp to prepare to play for Triple-A Scranton/Wilkes-Barre. Boone said Estrada was one of the Yankees’ minor-leaguers who stood out when he watched video after getting the manager’s job two offseasons ago. “To see him playing and playing like this and impacting the ball and playing well at both second and short, I’m getting a peek at why I got a little excited about him when I watched him last winter,” Boone said. Another youngster who is making a name for himself in the Yankees’ system is baby-faced lefthanded reliever Phillip Diehl, a 24-year-old who had a big moment last season at Yankee Stadium. No, Diehl didn’t make his major-league debut. After the minor-league season ended, Diehl was brought to the Bronx to throw to Aaron Judge in a simulated game as Judge was rehabbing a broken wrist. Boone said the 6-2, 180-pound Cincinnati native with the black eyeglasses caught his eye on that day. In 2018, Diehl went 2-3 with a 2.51 ERA at two levels, topping out at Double-A Trenton. He struck out 108 in 75 1⁄3 innings.